Born in Aargau, Switzerland, Joseph Meierhans came to America in 1917 and lived in Allentown, Pennsylvania before settling in Perkasie in upper Bucks County. 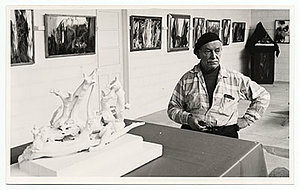 Meierhans was a prolific artist having produced many abstract paintings during his lifetime. He studied in New York at the Art Students League with Karl Knaths, John Sloan and later with A N Lindenmuth. He became a member of the Society of Independent Artists, the Provincetown Art Association, the Lansdale Art League, and the Lehigh Art Alliance.